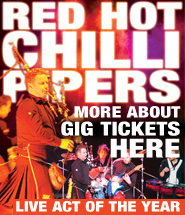 The Chillis are touring world-wide throughout the year - this is a live experience not to be missed !! TRAD MUSIC :: LIVE ACT OF THE YEAR !! The Red Hot Chilli Pipers are one of the most famous pipe and drum groups in the world today with a blistering set of Rock Bagpipes that astound viewers and critics. They have performed all over the world at the biggest of events from A-list celebrity parties to T in the Park and the Chang Mai Rock Festival. With three graduates from the Royal Scottish Academy of Music and Drama in the band they put a whole new spin on the bagpipes taking the music to a new audience. Bagpipes with attitude, Drums with a Scottish accent and a show so hot it carries its own health warning. The Red Hot Chilli Pipers have been rocking the world from Athens to Beijing with musicianship of the highest order and a passion for pipes that will leave you breathless. Putting a modern spin on incredible piping and astounding drumming with an emphasis on showing off, and creating a show guaranteed to amaze any audience. The Red Hot Chilli Pipers really are a genuinely unique experience.